Don't waste your time squinting and straining your eyes, trying to read miniscule text in bad lighting. The Illuminating Handheld Magnifier makes reading the smallest text, in even the worst lighting, a breeze. 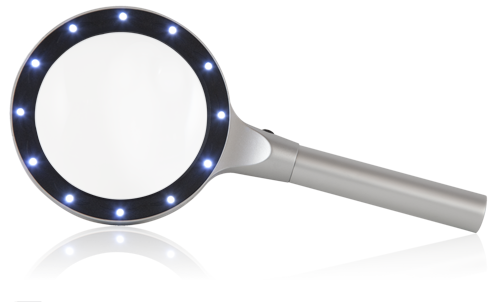 The Illuminating Handheld Magnifier (MAG12) is a light weight, LED lighted h magnifier with a 5X magnification lens. With twelve (12) super bright, LED lights, the MAG12 enables you to read small text, or see fine details regardless of the lighting. The push button switch comes with two settings, low, or high brightness, to feet your needs no matter where you are.